At the Heroine Make's Princess Ball Event (Read about the event here! ), I received her famous Long & Curl Mascara. This mascara took top spot as the No. 1 Mascara in @cosme's 2009 and 2010 Best Cosme Awards! As mentioned before, this mascara is made up of an advances polymer coating. It contains Super Long Up Fibre, which is 1.5 times longer than the old version. Wrapping itself closely to every lash from the root to the tip, it gives a lengthening effect of up to 120% more. Without clumping! The polymer is also able to hold the curl of your lashes and the mascara is repels tears, perspiration, water and sebum! The wand sports a small curved brush and it was designed as so so that it fits the natural curves of our eyes. This ensures that the bristles get to every single lash. 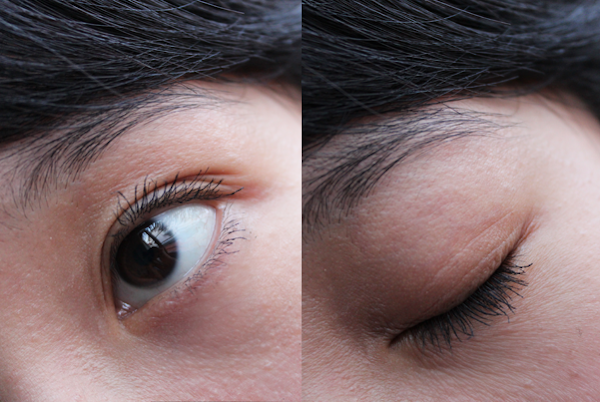 Above are the photos of my lashes taken at the end of the day. I skip the eyelash curler as there is a natural lift to my lashes. I was pleasantly surprised when I made the first swoop of the mascara on my lashes. My lashes were painted a deep, glossy black and were distinctly longer and separated. As the brush head is small, I could get the tiny lashes at the ends of my eyes easily. The mascara lasted the entire day (About 12 hours.) and did not smudge at all. There were no dark shadows below my eyes at the end of the day.